Chinese food is more than the straight-forward, plentiful and cheap fare we are used to see in many Chinese restaurants over the world. If we peek in a Chinese pantry, we immediately notice that rice and noodles are staple food for Chinese people. Many meals consist of a rice or noodles base with bitesieze pieces of vegetables, seafood or meat added and accompanied by a variety of other dishes including more vegetables and meat.Most meat dishes include pork or chicken prepared using some of the traditional methods. Chinese food is famous for its bright colors, beautiful forms, tempting aromas and variety of flavors. 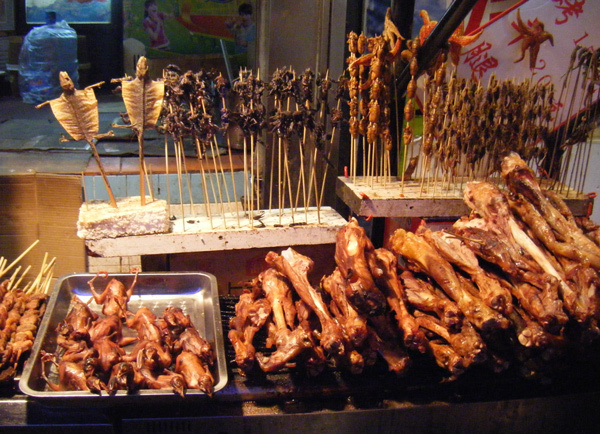 Chinese cuisine is wide and varied. There are many cooking styles in that vast country. Chicken lo mein is a recipe for stir-fried chicken and vegetables where boiled noodles are added at the end to warm and soak the stir fry juices. Chow mein is a generic Chinese name for a dish of stir-fried noodles. This mushroom and spinach chow mein is one of the many hundred variations. Jiao zi, the Chinese dumplings, are popular in a traditional dim sum cart. Peking duck best known recipe from Mandarin cuisine.